There are vintage ads. 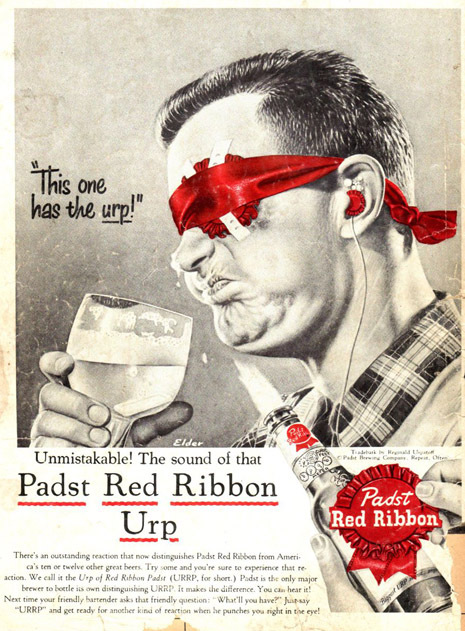 And there are vintage spoof ads. The Dangerous Minds has an article about the advertising parodies of MAD Magazine. The publication was able to survive without any outside ads – meaning they were free to make parodies. The tobacco industry was often the target, but there were some breweries among the victims as well. This one is from September 1956. More ads on Jasperdo‘s Flickr account. I was sipping a beer ( a very nice brown ale, since you ask) at Schouskjelleren Mikrobryggeri, one of the Oslo brewpubs, some days ago. Their blackboard shows their range of beers on tap, six of their own, the rest hand picked from around the globe. Wheat or wit, IPAs, pale ales, usually at least a sour ale, an imperial stout, maybe a barley wine. But, for the last six months or so, they also have their own pilsener. They have always had Hansa pils, but it is not promoted in any way. An industrial alternative for those who get too scared of all this craft stuff. The Hansa pils is not selling much, though. The regulars want the home brews or the hand picked imports on the blackboard. Their own lager is another story. The barman told me they have pulled it form the menu at times to stimulate the sale of their other beers. 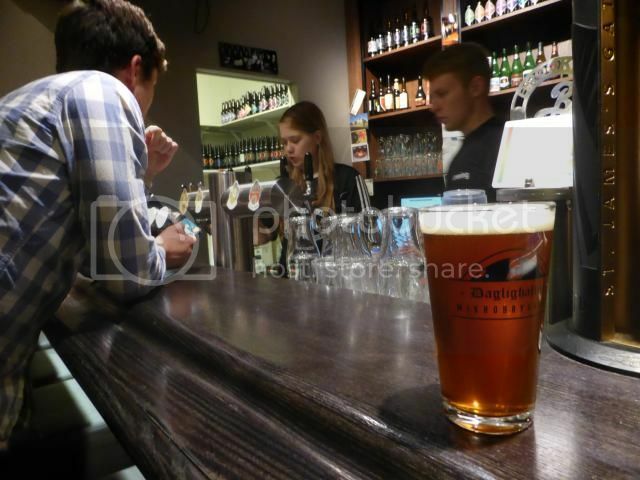 If you want Norwegian craft lager to take home, there are a few really good ones available from micros like Lillehammer Bryggeri and Sundbytunet, but they have a very small distribution. Lervig started out as a lager brewery, way before Mike Murphy arrived to start making top fermented beers. Their pilsener varieties did not impress anyone back then. I’ve been told that they are much improved now. I will give them a try, but there is a lot of marketing work to be done as well, perhaps integrating a pilsnener and a few other lager varieties into their series of well designed bottles and cans. But the one to look out for is further north on the west coast. Kinn has announced that they are reducing their range of beers to concentrate on a core range. But among those core beers, there will also be a pilsener. Knowing the quality of Espen’s beers, I’m sure this will be a winner. But they might have to consider the price level. I’m not sure how much the Norwegian consumers are willing to pay for a bottle of pils, however good it is. We are used to drinking our pale lagers in larger quantities than the darker and stronger beers, so it’s a matter of keeping the price of a six-pack down to a reasonable level.